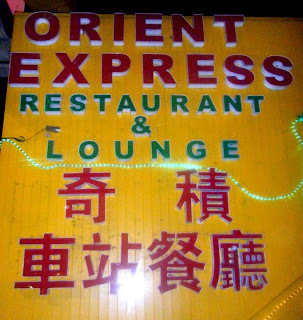 The drinks are pedestrian at best, and the food (Chinese/Thai/American) did not seem remarkable, but of course what you go to the Orient Express for is the setting. It occupies the seven old time railroad cars that once hosted Andy's Diner. It's a strangely compelling combination of elegant old railcar decor and sloppily assembled Chinese-American restaurant signage, and features various nooks and crannies such as a private karaoke room and a surprising upstairs performance area. While thinking about this place makes me depressed I gotta admit that they somehow managed to make a gaudy, crappy looking Chinese dive that seems as if it's been horrible for years.